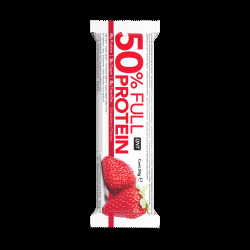 This delicious shake contains 53 grams of protein and high quality carbohydrates. It tastes great, is available in 4 flavours and doesn’t contain any gluten. USE: Drink one shake every day between meals. INGREDIENTS: milk protein product 91%, sugar, maltodextrin, flavour, salt, stabilizers E407, colour: E101. Contains milk (including lactose).